NETWORK FINALS: The SUPER BOWL adjusted to 37.1, 0.6 below the final number for 2016’s game. 24: LEGACY held at 6.1. CABLE HIGHLIGHTS: The highlights were few and far between on Super Bowl night, with the top show ESPN’s post-game analysis at 1.03. 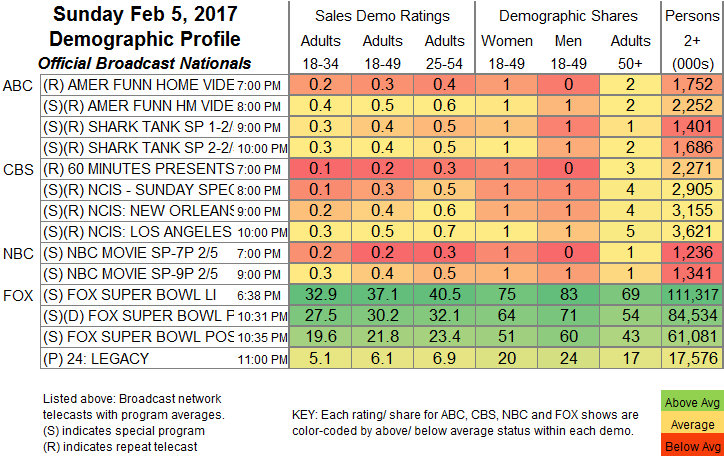 Animal Planet had its yearly run at a big number with 0.79 for the PUPPY BOWL, a tick down from 2016. (Hallmark’s KITTEN BOWL couldn’t compare at 0.14.) At 9AM, Nickelodeon’s TEENAGE MUTANT NINJA TURTLES was at 0.40. Food Network aired a new WORST COOKS IN AMERICA, down 0.24 from last week to 0.34, and GUY’S GROCERY GAMES fell 0.18 to 0.28. Adult Swim’s midnight SUPERMANSION dropped 0.08 to 0.34. 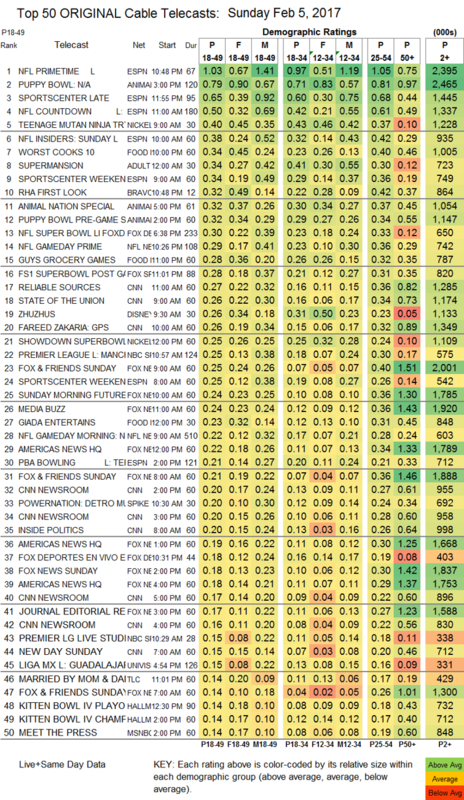 Bravo’s 12-minute “first look” at the next REAL HOUSEWIVES OF ATLANTA episode hit the Top 10 at 0.32. TLC’s post-primetime MARRIED BY MOM & DAD slipped 0.02 to 0.14. HBO kept THE YOUNG POPE going, down 0.11 from last Sunday’s episode to 0.09. Starz’s BLACK SAILS was also at 0.09, down 0.14 from last week.